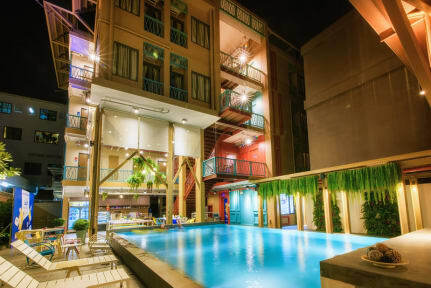 The largest, newest and most modern hostel in the centre of Siem Reap! Just a 5 minute walk to the famous Pub Street, and even less time to walk to the Siem Reap River and Old Market. After creating Lub d Phuket, voted the “Best New Hostel in the World 2017” “Best Hostel in Thailand 2018” and “Best Extra Large Hostel in the World 2018”, Lub d has opened the most talked about property in Siem Reap, thanks to an amazing design, team, atmosphere, and facilities that have to be seen to be believed. 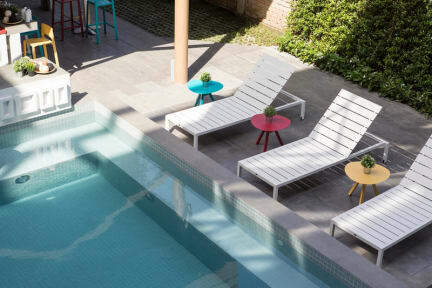 Lub d Siem Reap offers a Khmer-chic inspired property design, including a swimming pool with swim-up pool bar, great lounging areas throughout the common area, games area including pool table and old school Pacman arcade game. We have all-day breakfast, delicious barista-made espresso coffee and a-la-carte dining at The Little Red Fox Bar & Cafe, plus our Grab N’ Go counter for snacks. Join our dedicated guest activities team for one of our exciting activities, and book a tour to the famous Angkor Wat temples or an exciting adventure tour to the Cambodian countryside at our Adventure Travel Co. tour desk. If you’re a digital nomad, blogger, entrepreneur, or just in need of a working space while you travel, everything you need is right here at our Garage Society co-working space! We have 24-hour reception and security, elevator access for all rooms, and tuk tuk drivers on stand-by to get you around town. Great hostel in Siem Reap! The staff is super friendly and the place has great food! The hostel has a nice pool where you can relax and meet nice people. Definitely worth the money! Super hostel! Je hebt het idee dat je in een luxe hotel verblijft. Alles zo schoon en goed voor elkaar. Fantastisch hostel, goede vibe, heel erg aardig personeel en prima kamers. Goede uitvalsbasis om Siem Reap te ontdekken. This hostel is great! Stayed in Phuket (Thailand) also in this hostel and would reccommend it to everyone. Supernice staff, superclean, great beds and swimming pool is awesome! We got a free upgrade to a private room. Everyday the hostel organizes activities, so its easy to meet people if youre travelling alone. Best hostel to stay at! Spacious dorms, comfy beds, well-equipped bathrooms, amazing food, the best staff... I could not recommend this hostel more, definitely stay at Lub D! Het allerbeste hostel ooit waar ik heb gezeten! Alles was super schoon, je krijgt een handdoek bij voor de douche en kan een aparte pakken bij het zwembad. Al het personeel is super lief en behulpzaam en het eten uit het restaurant is heel goed. Er worden leuke dingen georganiseerd en je leert makkelijk mensen kennen als je alleen reist. Echt een aanrader als je in Siem Reap bent! Heel leuke hostel. Ze organiseren leuke uitstapjes, vooral de bike city tour was heel tof! Zeer proper allemaal, zowel douches, toiletten en slaapzalen. Ik had kort verblijf bij lub-d hotel het was echt goed, , de kamer was mooi , en schoon de hotel personeel was heel vriedelijk en behulpzaam,ikraad iedereen deze hotel. Carlito. Best hostel ever! Very clean and luxury. Nice food, pool and people! Bathroom also very clean, with hair dryer and more included.